Valve have sent word today that their digital card game Artifact [Steam Link] is officially releasing on November 28th and it will be playable at PAX West between August 31st and September 3rd. 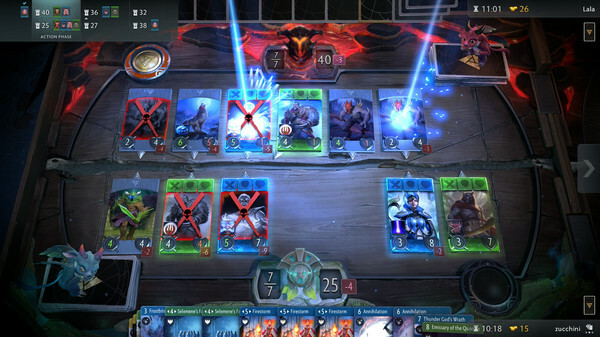 Artifact is designed to give Trading Card Game (TCG) enthusiasts the deepest gameplay and highest fidelity experience ever in a fantasy card game. Offering more than 280 cards in the shipping set, players will be able to buy and sell cards on the Steam Community Marketplace. Players will battle each other in a continuous, single-elimination gauntlet for the right to challenge a champion on the main stage. Everyone who plays will earn Artifact merchandise, including signed prints of artwork and two keys for free copies of the game when it is released. It will be priced at $19.99. As a long time fan of such card games, it's pleasing to see Valve continue to push Linux support. We already knew this of course, as they already confirmed that fact previously. It will be interesting to see what people think about the ability to buy and sell cards once it's live, since that's very much like a real-life experience for any competitive/collectable card game. I'm definitely looking forward to it. Not a fan of card games such as HearthStone, but seeing that it's Valve and Valve supports Linux; AND, assuming it will have day 1 Linux support. I will probably give this one a shot. Interesting, I still haven´t tried "Slay the Spire", which I believe is also some kind of highly acclaimed card game. If I enjoy that title then I might just be hungry for more come late november. I've been hoping to see a good and fun alternative to Hearthstone. I wished MTG Arena was available for Linux but alas, I hope Artifact will be a decent TCG without requiring a lot of funds to have fun casually. Can't wait to give it a shot. YES! Can't wait. I'm a huge fan of card games, hope it's really good. A card game using steam's market does sound like fun. I know nothing of DOTA though. I'll probably give it a try. It's attached to the community market, and there's almost certainly going to be microtransactions, so that's enough to get a no from me. The fact that it has an entry fee is almost an insult considering it's GaaS. I was originally interested in this, as a Dota 2 player who can occasionally enjoy a card game. For it to be based on Dota and not be free-to-play is a deal breaker though. I'd rather spend money on Dota 2 itself (which is nervously approaching the possibility of not having as big a prize pool for the The International tournament this year versus last year - game might be on the decline).